Did we really get beat by the 25th place team and become only their second win since the season started? It was kinda of hard for Ranger fans to not ride the wave of a good 7-1start to a conclusion that this team has changed. Injected youth, point men with hard shots on the power play, developing defensive studs, and lastly the pure goal scoring of Marion Gaborik. The slick styling of the silky Slovak (say that 5 times fast) wouldn't be present for this game due to a lower body, non groin related injury and while Del Zotto had been outscoring his former teammate, the highly touted John Tavares....In the context of a rivalry, pedigree means nothing. Read the official recap, here. In the first period, the blueshirts were caught off guard early as their defensive mistakes came back to bite them only a minute into the game as a quick pass lead to a breakaway goal for the islanders. 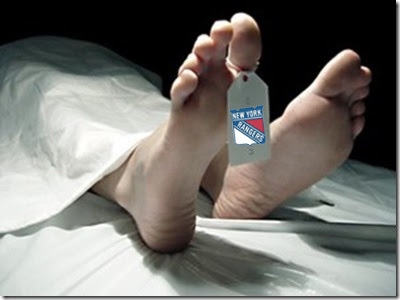 Enough to make every Ranger fan wince, it would only be a taste of the abuse the team would endure for the first period. While the scoring was kept to one for the Islanders, their forwards battered their Ranger counterparts like .. well, like a fish sticks. While individuals like the feisty, but vertically challenged Ryan Callahan tried to hold their own, this was a rivalry game and team effort would be required to match the once we were facing by a team driven with the idea of nothing left to lose. A standout for the Rangers was the visiting PA Parentau, who showed he wasn't thinking about just visiting when he scored the lone goal for the rangers and kept up a high energy level throughout the game. As a call up, Parentau also had nothing to lose, showed a sense of urgency the rest of the team sorely lacked because he felt he had everything to gain by keeping things simple but working hard every shift. In the Second, the Rangers would come out of the lockeroom fired up and seemed ready to meet the physical requirements the game demanded. That would put the teams back on an even keel momentarily as the Rangers would give as good as they got for a few shifts. That soon faded as the Rangers watched indifferently as the Islanders resident Frankenstein (Sutton) skated cross ice at will, elbowing and falling into other Ranger players with vigor. The fierceness with which our boys in blue had played for a few shifts, completely evaporated and was only hinted at with verbal jabs after being boarded and players like Girardi, tossing an Islanders player aside like yesterdays garbage only after he grew frustrated with harassment in getting to the puck. These could be called signs of life, but as we learned during the Renney administration... In its purest form, hockey is a game of aggression. That's the what the pads are for and purely offensive systems or playing out of defensive shells won't work without the basic understanding that things can't always be pretty and sometimes you'll have to get your hands dirty if you want the win. Tortorella would later echo these thoughts after the game. "I thought they wanted to play harder than us tonight," he said. "I think we're too easy a team to play against in these types of games. They played hard. They played through the body, and we didn't answer as far as hitting back, other than for a few shifts in the second period. "We simply have to be a harder team to play against." The frustration seemed to be mounting on the Rangers side and boiled over in net when Lundqvist snapped and lashed out after making an excellent stop only to have Girardi over skate the rebound and swipe underneath the bouncing puck, leaving it wide open for the islanders to chip in the go ahead goal. Things only got worse from there as the Ranger forwards spent the night trying to speed through the neutral zone and attempting to corral pucks from behind as an afterthought while trying to avoid the physicality and pressure. It was akin to watching a 7 foot man running through the rain with a chihuahua in tow that cant keep up. It's a horrible habit our team has formed in the linear thinking they have receded to after the first few wins. Offensive mindset + possession of the puck = win, purely on # of goals. This would be a winning formula in many sports. First and foremost, this is hockey, where one check can separate you from the rest of your career if you're caught with your head down or looking the wrong way. Our players spend way too much time looking backwards on the rush using the skate and scoop from behind method and taking shortcuts to puck possession by chipping it along while hoping for slight of hand to help confuse the defense. It results in goals some times but painful turnovers the others. Our D-men do the same and over skate the puck, thinking of threading the neutral zone with perfect outlet passes for cherry picking forwards before they even secure possession of the puck. I think think they team needs to be taken back to the woodshed and give a reminder of what hard work, crisp passes and stiff shoulders are all about. Playing a complete game at a slower speed is the only way this team will learn to do it under pressure at a higher speed. That "uh oh" feeling haunts this team, even when the difference between last year's squad and this years is 6 or 7 players. Every team has the potential to completely break down, but we all know this of our Rangers. A quality that is consistent, unfortunately. There is a point at which the players stop listening to Torts if he comes on too strong every game -- so one can only hope 1. He shrugs off the game as 'it happens once in a while' or 2. He doesn't read your post to pont out the obvious, Jay. Sadly enough Dark, I think many of the Ranger players would like to believe that their shortcomings are a result of Torts system. I think they feel "rushed" and if they can't contribute offensively, then they can't contribute, which is a total cop out. I think the best stretch of wins coming in so far is a result of the offseason challenge to come to camp in shape and the conditioning exercises. The coach said what he wanted and the players worked on their own and only had to present the results. I think some of the kids are sitting around waiting to be told how to improve their game, and expecting a reassuring pat on the back, like in the Renney era. I hear big talk from kids like Dubi, "I have to avoid making dumb plays..." (well no f*ckin sh*t, Dubi...) and then he comes out the next game and makes 3 more. These kids were softsoaped upon arrival and fawned over because they were the future of our organization. Well it's time to learn about expectations, especially if you want to haggle for money and hold out, or think your position on the team is locked in because of your last name (Staal)... or you were a stand out on D, 2 seasons ago (Girardi). Notice how its harder to notice and easier to dismiss the mistakes of Gilroy, DZ, or Cally ... because for every negative, they're trying at least 3 or 4 positives. Also, am I wrong for wishing Semenov flipped off his wife and stayed on with us. At least someone would be playing physical even if they weren't doing much else. Our other big bodies are look very anemic. Boyle and Voros get taken off their feet by guys half their size, skating backwards. The opposite side of that coin is the simple fact that, under the salary cap, in a top five market, being saddled with salaries of players that aren't performing to potential, players who are too young for the responsibility are being looked at to be the role players. Their growth is being rushed as they are rightfully trying to live up to the expectations. Think of a guy like Petr Prucha. 25 goals one season, then a severe drop off the next (due to the pressures of working with a poorly built team), and now he's playing out in a Pheonix of all places. It's like being sent to Siberia. For all your hard work, you get looked at as damaged goods and you wind up being part of lump trades with teams that are even worse than the one you're leaving. That's part of the reason Dubi fought for a contract increase now. Everyone was predicting that this team would end in 13th place. A guy like Dubi is super trade bait. He could easily wind up in a place like Atlanta in a bloack trade for some guy named Ilya. Then what? He'll fall into obscurity. I think I'm going to call this phenomenon the "Malhotra Effect." Feel free to quote me. You have apoint and I myself have wondered about the "malhotra effect", be told if you can be sent to a lesser team and fail to standout much, it may not have been such a bad trade afterall. I think every player has role. Prucha's role with us seemed to be a power play time waiting to be thrown scraps (well that and getting his clock cleaned.. a habit he appears to have taken to the desert with him). I think we have a better version of that in Callahan, Avery, etc. etc. now. I also, for myself anyway, can't ignore the Jagr factor in Prucha's stand out year. The good news being, we have a different coach that seems to realize the power of that effect. Tortorella will shift anyone and everyone with Gabby now and tried to get the rolling and then switch them off to a different line to see if that momentum carries to that line. Which has gotta be better than the past, in which Renney give the line changes all of 30 seconds or till the first Jagr frown and then switched guys off, except for his precious 4th line... of which he held onto for dear life. I'm also like Torts ability to say screw it and bench anyone over a stupid play (except drury.